Normally, I don't bother posting here what work I do for the news department, but today is different. Today, I posted a very simple article about an overly medicated woman who drove her Lincoln in to the State Street Christmas tree. She was not seriously hurt, from what I've heard, and I think that makes it okay to look at the humor in a situation where the poor woman had to, at some point, figure out how a tree had grown out of the middle of a normally tree-less road. 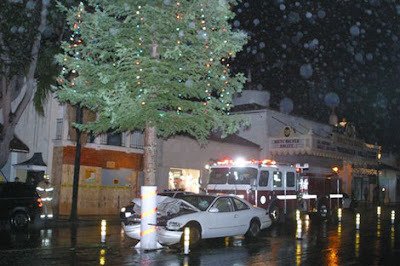 Well, that and the fact that the tree survived the collision with nary a twinkle light out of place.